Balancing Act - Self Portrait in Colored Pencil 12" x 36"
My still-lifes and portraiture often explore the strangeness of depicting space, depth and form on a 2-dimensional surface. I enjoy creating space. I often tell my students that a realist artist is a magician, since we are essentially illusionists trying to make it seem like an object is there when it is not. To see my work in person, come see me at the Portland Saturday Market in Old Town, Portland, OR. 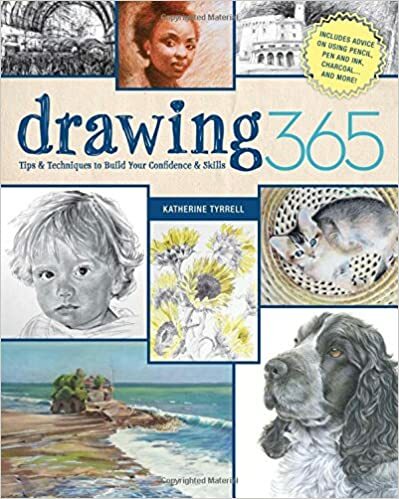 Several drawings included in the book "Drawing 365" By Katherine Tyrrell 2014 Northlight Books. Drawing featured on the Derwent Coloursoft colored pencil tin. > Created all the artwork for the brochure for the Luminance pencils by Caran D' Ache including tutorials. > Created drawing tutorials for the Derwent Pencil Company featured on their website. > 2 drawings included in the "Still life Secrets Showcase" in Ann Kullberg's book "Colored Pencil Secrets for Success." > Created 3 colored pencil kits for sale at www.annkullberg.com. 2013 - Received 5 year signature status in the Colored Pencil Society of America by being juried into the international show 5 times. 2011 – Received signature status in the Colored Pencil Society of America by being juried into the international show 3 times within 10 years. 2008 - Best of Show & People's Choice Award in the Thorne Sagendorph Biennial Regional Juried Show. 2008 - Best of Show CPSA 112 Juried Competiton: H2O. 2008 - President's Award, UKCPS 7th Annual Open International Exhibition 2008, UK. 2007 - First Place in UKCPS 6th Annual Open International Exhibition, Nottingham, UK. 2007 - Prismacolor Award, The Art of Colored Pencil New England Juried Show, Gallery 297, Bristol Rhode Island. 2007 - First Place Art in the Park, Keene, NH, dry media catergory. 2006 - Finalist in the 23rd Annual Artist's Magazine Art Competition in the Still- Life Category. 2005 - Second Place Art in the Park, Keene NH, dry media catergory. 2005 - First place in the 2005 Keene Art Association Spring Juried Show. 2004 - Second Place Art in the Park, Keene, NH, dry media catergory. 2013- present Art Teacher for Woodland Public Schools. 2013 Jamaican cruise workshop with Ann Kullberg. Was invited to teach a day long drawing workshop by 7 book author/artist Ann Kullberg. 2009 – 2013 – St. Joseph Regional School, Keene, NH. Duties include teaching and writing the art curriculum for all students preschool - 8th grade. 2008 - Caribbean cruise workshop with Ann Kullberg. Was invited to teach a day long drawing workshop by 7 book author/artist Ann Kullberg. 2007 - Alaskan cruise workshop aboard the Sun Princess with author Ann Kullberg. 2005-2010 - Moco Arts, Keene, NH. Taught adult drawing classes and children art classes at a local community school. 2006-2008 – Sharon Art Center, Peterborough, NH. Taught adult drawing classes. B.S.E.D. In Art Education from Northern Illinois University.